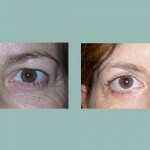 Eyelid surgery improves the aged, tired look in the eyes. 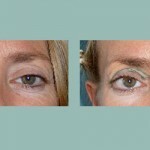 By means of incisions located in the superior eyelids´ natural folds, and incisions very close to the eyelashes in the inferior eyelids we remove skin excess, a section of the orbicularis muscle and the fat bags, as it may be necessary. 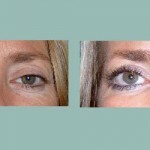 In people who do not present redundant skin in the inferior eyelids, we can exclusively remove the fat bags by means of a procedure called “transconjunctival blepharoplasty”, making an incision inside the eyelid, without scars. All patients must take pre-surgical studies and the specific risk factors in each case are analyzed. The surgery is practiced in an out-patient basis (without in-patient stay); under local anesthesia plus a sedation provided by the anesthesiologist for the patient´s greater comfort. The procedure doesn’t take more than an hour. of superior and inferior eyelids. Within 48 to 72 hours the patients can retake their normal activities without making excessive efforts. Minimal post.operative cares are required. It is usual that a post surgical edema (swelling) develops in some degree, during the first 2 or 3 days after the surgery. 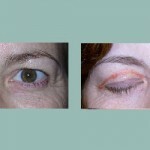 Another complications can occur, but are infrequent or are of minor importance.